Compare prices from several car hire companies in Cadiz and find the best price for car rental. Our prices always include unlimited mileage and insurance. 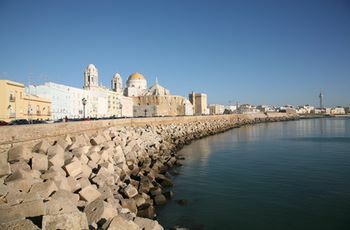 Cadiz property AndalucíDa region and is located in southwestern Spain. The city is located at the Cádiz bay that leads out into the Strait of Gibraltar and the Atlantic Ocean and the harbor here is important for the entire region. In 2010 the population was estimated at nearly 130 000. Cadiz is famous for hosting one of the world’s largest carnival, and this tradition has upheld the Spaniards since the 1500s. Every year, the party held the weekend before Ash Wednesday, and it is strongly recommended to visit the city at this time. Besides the carnival, one should take in the city’s cathedral, traditional and typical Spanish square, beaches and Roman ruins. Jerez Airport is located approx. 50 km north of Cadiz.From here there are flights to include Madrid, Barcelona and London.